> Thai balsams>Black balm 120 gr. By buying this product you can collect up to 15 loyalty points. Your cart will total 15 points that can be converted into a voucher of ฿ 3. 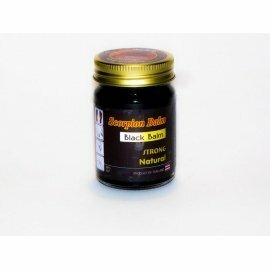 BLACK THAI TIGER BALM is the most hypoallergenic balm. Suitable for children and people with sensitive skin. Black color is due to the seeds of black sesame in the composition of balsam. It is used for various injuries, bruises, sprains, sports injuries, muscle spasms, arthralgia, osteoarthritis, gout, cervical and lumbar spondylitis, bursitis, joint inflammation (fibrositis, capsulitis, bursitis, myositis, synovitis and lumbosacral radiculitis). It removes skin itching. Helps with insect bites.